Luke Holden quit his job on Wall Street in 2009 to follow his dream of opening up a restaurant selling lobster sandwiches. His small place in New York's East Village quickly garnered a loyal following, and Holden, who comes from a fishing family in Maine, has since opened up three restaurants. How has "Luke's Lobster" grown so rapidly despite the worst recession in decades? Holden hasn't spent a dime on television spots or newspaper ads. But he has spent a great deal of time on social networking platforms like Twitter and Facebook. One of Holden's most powerful tools to reach new customers is a relatively new location-based social media tool called Foursquare. You might have heard of Foursquare, but if you're not using it for business, you're missing out on a powerful marketing and engagement tool that can help any business -- large or small -- tell its brand story to an entirely new category of consumer. Foursquare is a location-based social networking platform that helps users explore their world. Foursquare recently hit one billion check-ins. That means people around the world are using the Foursquare app on their smartphones to check in to places like restaurants, pubs, gyms, hotels, campuses, stadiums, retail stores, and just about any other type of physical and even nonphysical locations. Users are checking in at the rate of 34 times per second and they are doing so in every city, in every country in the world. Once they check-in, users often share that information with friends, families and followers on Facebook and Twitter. Foursquare users compete for badges, points, and "mayorships," awarded to those who check in to a place most frequently. The app is fun and can make the world a more interesting place. But the full power of Foursquare is unleashed by giving local businesses a tool to attract, retain and engage their customers in ways that were never possible. Here's how. Stake your claim. 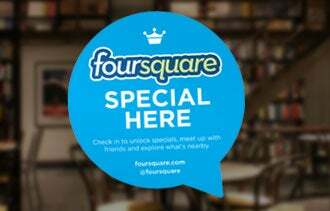 As a business owner, you can claim your venue on Foursquare (for free) and create "specials." Specials are rewards for people who check in. You can reward people simply for checking in, for checking in a certain number of times, for checking in with friends, or reward the person who checks in the most (the "mayor"). For example, Chili's Grill & Bar, a national restaurant chain, rewards its customers with free chips and salsa every time they check in. The marketing director tells me it helps separate Chili's from the "sea of sameness" customers confront when they are looking for a casual dining chain. How does Chili's make money on the deal? Simple. People don't walk into Chili's just for free chips and salsa and leaves. They order appetizers, entrees and drinks. RadioShack takes it one step further. The electronics chain rewards Foursquare users just for checking in, but it also reserves a special reward for their stores most loyal customers, the mayors. RadioShack's first campaign rewarded anyone who checked in with 10 percent off qualifying purchases. The mayor received an additional discount of 20 percent off. Lee Applbaum, RadioShack's chief marketing officer, told me that he joined Foursquare to help "redefine RadioShack for consumers, to contemporize the brand and to leverage the conversation around mobility" since part of RadioShack's mission is to be viewed as the leading specialist in all things mobile. Foursquare's demographic was alluring. Early adopters are, by nature, young, mobile, engaged, and likely to spend more. "Those are the people we need to attract," says Applbaum. Does it work? According to Applbaum, it sure does. Foursquare users who unlock specials spend three-and-a-half times more money than the average RadioShack customer. "That's a big number," says Applbaum. Rethink your business. The outlook for the Milwaukee restaurant AJ Bombers looked bleak at the height of the recession in 2008. That's when owner Joe Sorge knew that he had to do something radical and innovative to save the struggling restaurant. "I had to find a way to gain exposure without spending money," Sorge told me. Sorge established a presence on Twitter and Facebook, but things really got rolling when he joined Foursquare. AJ Bombers was the first venue to host "swarm parties" in which users get badges like the "swarm badge" for being in the same place with 50 Foursquare users or more. Not only had 50 people shown up for Sorge's first event, another 150 showed up as well, doubling the average sales for that day. Sorge was hooked. He kept up the parties but also offered unique and creative rewards for his most loyal customers, such as customized monthly menus for the mayor, free burgers or deserts for the mayor, or free cookies for anyone who leaves a tip on Foursquare (the venue has hundreds of tips and photos). Sorge says that in 18 months he earned as much or more exposure as his closest competitor in the city had garnered in the previous 10 years. Be creative and have fun. Some restaurants reward the mayor by setting aside a special table for that person or sending the mayor to the front of the line. Frozen-dessert franchise Tasti D-Lite puts a photo of the mayor on digital signs inside the stores. Walgreens is being creative by donating flu vouchers for people in need with every check-in. Foursquare gives you the ability to create more interesting experiences for your new customers, your loyal customers and their friends. Google CEO Eric Schmidt recently said, "The next generations of leaders and startups to emerge will involve mobile, local, and social. The future will be mobile first." People want to do more than purchase products. They want an experience and since they are increasingly living their lives on their mobile phones, retailers who provide them with a mobile experience will stand out. It's likely that your customers are already on Foursquare. Go ahead and check. You probably have a mayor and don't even know it. They are waiting for you to engage them.